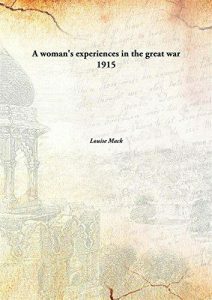 Let me tell you about a girl called Louise who became the first woman war correspondent, and who was the inspiration for the character in A Letter from Italy. 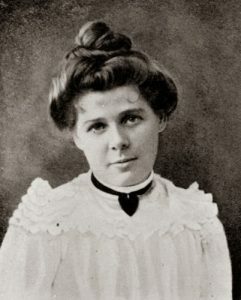 Louise was born in 1870 in Tasmania, the daughter of a Wesleyan (Methodist) minister and his wife – the mother of thirteen children. She was called Mary Louisa on her birth certificate. She was the eldest of those thirteen, and the family followed her father around Australia, eventually settling in Sydney. The children earned their living early – by the time she was 18, Louise, as she was then known, had already been a governess and was writing poetry and articles regularly for The Bulletin, where later (in her 20s) she wrote a column on the women’s pages and was known as “Gouli-Gouli”. Contemporary reports refer to her as ‘the girl contributor to The Bulletin’! She continued to write – mostly novels and poetry – and did reasonably well. Her novels were published in London, as most Australian literature was then (there being no real Australian publishing industry), including one of Australia’s first YA novels: Teens: A Story of Australian School Girls. Perhaps it was about her own exploits with her friend and fellow writer, Ethel Turner (Seven Little Australians). Mack and Turner were among a number of writers who put forward a view of Australian youth as being fundamentally different to European and specifically English youth: more self-confident, more competent, freer in thought and action. In 1901 she left for England without her husband, Percy Creed, an Irishman who became a barrister. We don’t know much about Percy except that he was a speaker on English literature in the University Extension Lectures, and was a fan of Robert Browning; perhaps it was a mutual love of poetry which drew them together. He was described, in the introduction to one of these lectures, as having ‘favourably established himself in the cultured walks of life in the metropolis’. He was later secretary to the Law Institute. Unfortunately, he drank and was an unsatisfactory husband. Certainly after this time, Mack was vocal in her support of women’s work and the need for women to have incomes of their own. But Louise Mack was already a writer, and she continued to write, although not in Australia. She left for London in 1901 and the newspaper article about it refer to ‘her lonely journey’ so we know she didn’t go with her husband. The fact that no one criticised her for leaving without him… that probably tells us all we need to know about their marriage. Then war broke out in 1914. Louise Mack, according to her own account, hopped on a ferry and went to report on the Germany invasion of Belgium. She reported for several weeks for the Evening News. And thus became the first woman war correspondent. She wrote a book about her time in Belgium, which is available for free from Project Gutenberg. In 1915, she came back to Australia and went on a tour around the country, lecturing about the situation in Europe and showing off her book. It’s a great story – she brought all her novel-writing skills to setting the scenes and describing the people she met. Some people have questioned a few of the claims she made in it – but I choose to believe the basics of her story. Read it and decide for yourself! You can download it here.